Suitable for almost any POS application: this special thermal paper is made from brand name raw paper and is therefore officially certified by Epson for use with all Epson thermal printers. Thus you are sure of only receiving consumables that preserve the hardware, avoiding any problems with the printer's warranty. For different thermal print rolls of different lengths. Depending on printer type, there are special rolls that take complete advantage of the maximum roll diameter, thereby saving every fifth roll exchange. The paper provides outstanding storage time for thermal paper under normal conditions. 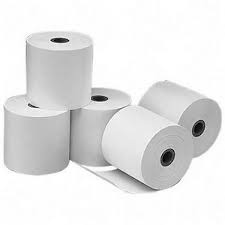 Besides the standard thermal rolls there is also longlife thermal paper for guaranteed storage periods of 25 years.